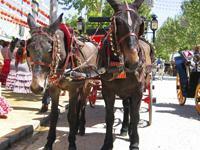 Fiesta and ferias are part of the Andalucian way of life and they go back in time, well before tourism ever was here. The people live to look forward to their summer and their annual ferias; this is why there are so many of them. 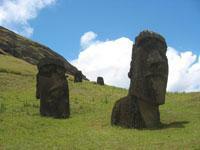 There is something going on all year round all over the region. Between their Christmas, Easter, the processions, the pilgrimages and the ferias and fiestas it is a wonder there are any working days left in between. If you plan your route and travel form one village to another I think it may be possible to spend a good few months of the year in a state of constant making merry. I believe that some actually do just that! 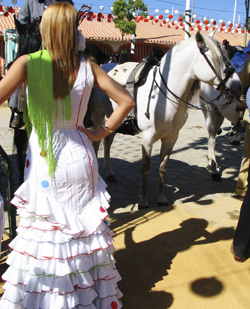 Almost without exception, every town and village celebrates its annual week long summer "Feria", mainly between spring and autumn. When its fiesta time every one is assumed to want to celebrate and most local businesses, even some shops and banks, close down usually starting the week-end on the Thursday of that week. Children, ladies and even men dress up in their traditional Andalucian Costumes, riders parade on their horses, bars place their tables and chairs right out on the streets serving drink and food, the air fills with music and song and you will see people dancing and singing spontaneously. Every one is welcome to join in the festivity while Flamenco and Bullfighting become the order of the day. In some places such as Jerez and Seville, it is customary to find "Casetas", usually tents, where the food and drink within them is free because they are confined to friends, relatives or business associates however, any one who asks politely may be granted admission because Andalucian people are very hospitable by nature, but should one be refused admittance, it is simply a question on moving on to the next "Caseta". There is always the larger municipal "Caseta" but the drinks and food are not usually free. The whole thing is a week long event without interruption day and night. Come the evening, the attention is focused on a (usually) adjoining fairground offering all sorts of joy rides such as bumper cars, merry-go-rounds, etc. and lots of very loud music that goes on until the next morning. The fiesta concludes with a display of fire works, supposedly at 00.00 hours on the Sunday, but... and the Monday after the feria also turns out to be a holiday to give people the chance to recover. The largest feria is the one that takes place in Málaga (start 11th August), whereas the most important and more traditional are held in Sevilla (start 24th April) and Jerez (start 3rd May). Marbella's fair (start 5th June) is also quite renowned for its opulence. It can be great fun to let ones hair down at a feria at least once, however if you do miss the summer fairs, do not despair, come autumn you can really celebrate in style sampling local wines at the wine festivals.